A peaceful excursion through Rodman Slough—passing Great Blue Heron and Double-Crested Cormorant rookeries (nesting areas)—to the culvert at Tule Lake. Beautiful views of the north shore ridgeline, oak woodlands, tule reeds, and the Middle Creek restoration area. This route is best taken in winter, spring, or early summer. Late summer and fall can bring intense sun, low water levels, mud flats, algae, and invasive weeds that may impede paddling. This is a great trip for watching waterfowl, particularly in winter and spring. 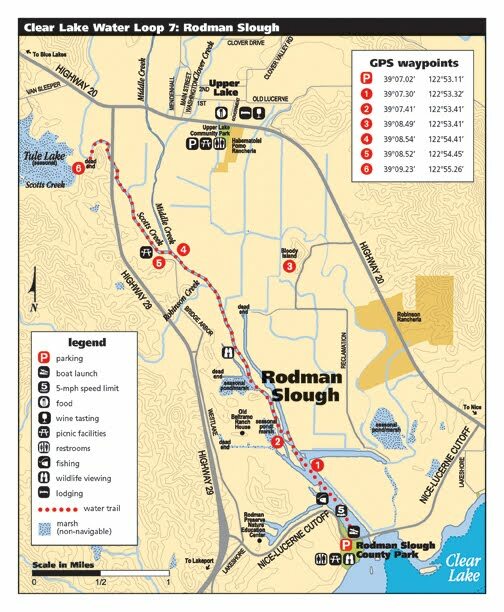 The water trail is accessed via a soft launch located just across the street from the parking lot at Rodman Slough County Park. It is not uncommon to hear the sounds of loud chirping; look up to see the huge osprey nest atop a telephone pole adjacent to the parking lot (P). The extension pole was installed by PG&E, to protect nesting birds from electrocution. Set off from the launch at the slough side of the Nice-Lucerne Cutoff Bridge. The first part of the paddle passes by the original Rodman Ranch and Slough, preserved by the Lake County Land Trust in 1998. The wetland areas of Rodman Slough and the surrounding oak woodlands are home to a large Great Blue Heron rookery. This dramatic bird, which stands four feet tall and has a sixfoot wingspan, is the largest of North American herons. In the fall, migrating birds congregate here. It is not uncommon to see large groups of American White Pelicans co-mingled with Canada Geese, cormorants, herons, egrets, and grebes. Just over half a mile into the paddle, you will reach a confluence (1) – take the center route. Continue a little ways and just before your first mile, you will see a small canal opening to the left (2). If you choose to paddle straight ahead, after one mile, you will reach a dead end. Not visible from the slough is nearby Bloody Island (3), the site of a huge massacre in the spring of 1850. For years, white settlers had enslaved and abused Pomo natives; the Pomo revolted. Accounts differ as to the number of Pomo – women and children included – who were ultimately slaughtered, as it is believed some escaped into the tule reeds. Currently on the State Historic Register, the Bloody Island historical marker is located on Highway 20. Turning left at waypoint (2), you will paddle through some downed trees to enter into the main route of Rodman Slough. The water is gentle here, and sounds of bird calls fill the air. You are passing by the proposed Middle Creek Restoration Project, stretching from here to Highway 20. The area to your right was once Robinson Lake. In the 1920s, levees were constructed to convert wetlands to farmland. While 9,300 acres of wetlands once existed in the Clear Lake Basin, roughly 80% has been lost. By removing three miles of substandard levees, this project will eliminate flood risk to 18 residences and restore more than 1,400 acres of lake bottom and wetlands, thereby enhancing wild life and fish habitat and improving the water quality of Clear Lake. At roughly 2.5 miles into the paddle, you will come to a fork, where Middle Creek (4) enters on the right. Stay to the left. Shortly past Middle Creek, you will see large cement pilings on each side of the slough; these are remnants of the Bridge Arbor Bridge, a great spot to stretch or have lunch (5). Scramble up the south side where a massive cement picnic table sits under a shady oak, overlooking the slough. During the later summer and fall, the water level may not allow paddling beyond this point, and you will have to turn back. Continuing on another mile, you will cross under the Highway 29 overpass. Note the numerous mud swallow nests that line the underside. Continue paddling for another half mile, and you will reach your turning point, a dead end at the culvert to Tule Lake (6). In the winter, Scotts Creek overflows its banks, forming Tule Lake, a seasonal lake that flows into Rodman Slough and on into Clear Lake. It is dry in the summer. The name was derived from the numerous tules that once covered the area. The roots were a favorite with Native Americans who camped on the shores during root-digging season. Near the culvert is a good spot to pull up and stretch your legs under shade trees, before retracing your strokes back to the Rodman Slough boat launch. As you head into the home stretch, Mount Konocti provides a beautiful backdrop.This is a route best taken in winter, spring and early summer, when the migratory bird population is higher, as well as the water levels.